Should Silicon Valley Fix Its Image Problem? Silicon Valley is known for a lot of positive things, but there’s clearly a negative sentiment from outsiders. The question is, does Silicon Valley want to fix this image problem? Decades ago, before it was called “Silicon Valley,” it was an area abundant with fruit and flower farms, redwood harvesting, and scattered towns connected via dirt roads. This fruitful area has also blossomed into computer chips, hard drive platters, networking gear, devices, computers, and internet companies galore. Many have become famous, gathered many riches, and helped to change other people’s lives. Today, Silicon Valley is experiencing the second gold rush, where investors, entrepreneurs, workers, and more flock to this region to strike it rich and make a difference. To understand perception, I asked my social media network of followers and friends who are NOT from Silicon Valley to chime in and leave three words about what their perceptions are of Silicon Valley, see the raw post on FB. The goal wasn’t to argue, or to judge, but to listen and learn what others think. We stripped out any answers from folks that I knew were from the area, and well, the findings are pretty surprising. There’s quite a bit of negative sentiment toward Silicon Valley, in addition to the adoration. Of course, this is not a truly scientific endeavor, these respondents are in my social graph, and I would make the assumption they’re familiar with the tech industry or business, which is my primary topic. A few findings: There are 534 words submitted that are ‘stand alone’ words. We segmented the data by sentiment; 161 are positive, 192 are negative, 181 are neutral. It was difficult to classify some of the phrases or words, so we had to do some data massaging and remove synonyms. There were some clear trends, as ‘Expensive’ showed up 36 times and ‘Innovative/innovation’ showed up 38 times. 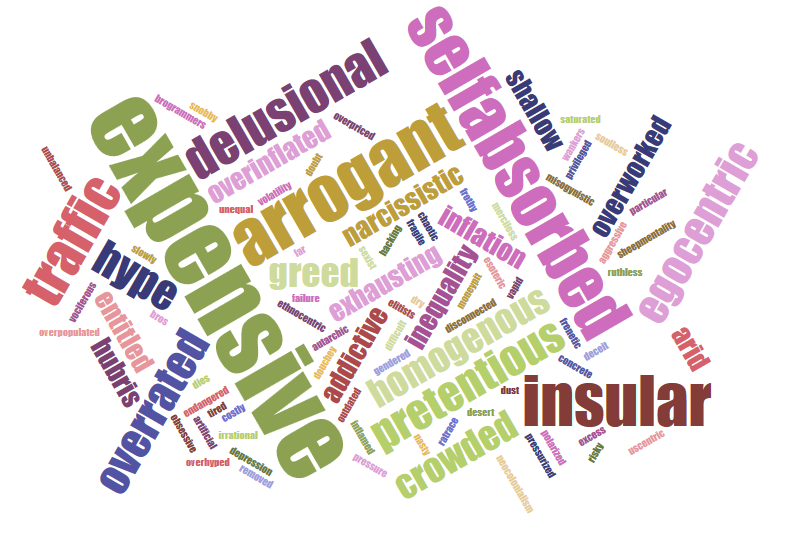 All of those wonderful things come with some severe drawbacks, which are nicely illustrated in the tag cloud, first let’s explore the positive sentiment. Below Word Cloud: Positive attributes provided from people who are NOT from Silicon Valley. The patterns are clear; Innovation scores the highest, then opportunity, exciting, optimism, and dreams. If I had to summarize it, this is a place to create and fulfill a dream. It’s arguable if young is a positive sentiment, as ageism is becoming rampant as investors favor the youth. It’s also interesting to see a variety of descriptions related to smart, ideas, and knowledge. I assume beautiful is related to the area, as the culture in Silicon Valley isn’t driven by physical beauty or fashion. 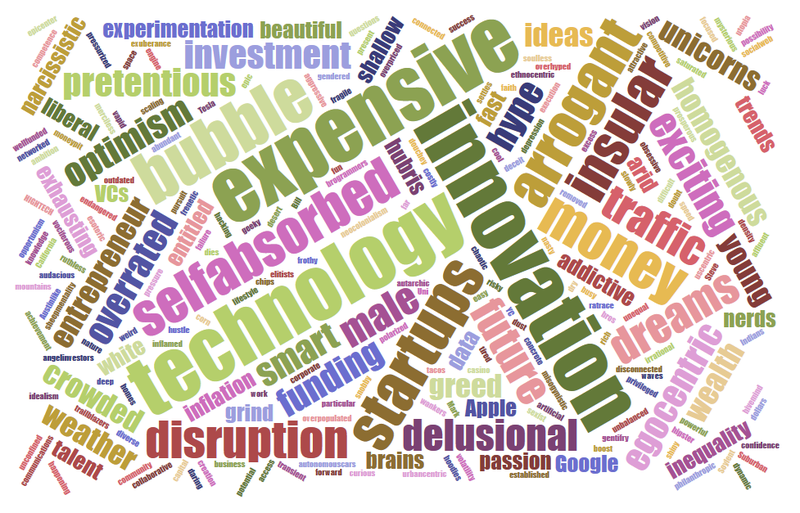 Below Word Cloud: Negative attributes provided from people who are NOT from Silicon Valley. 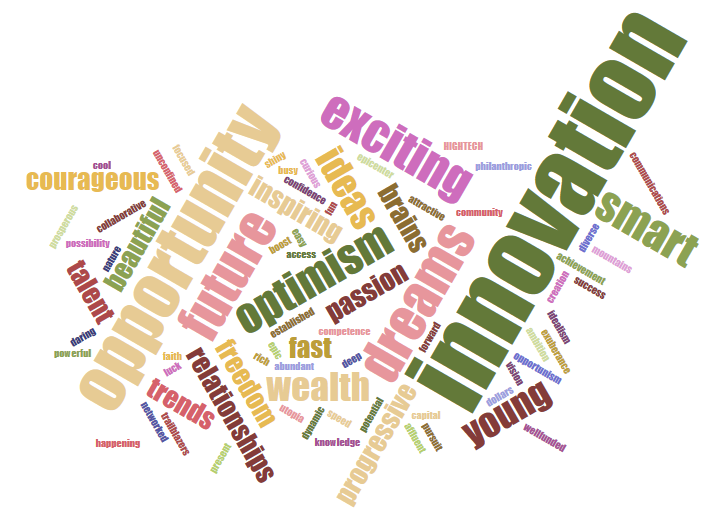 Below Word Cloud: Both positive, negative and neutral attributes provided from people who are NOT from Silicon Valley. Putting all the data together, you can see how al the terms nicely come together, including some neutral terms like “Unicorn, Investment, Money, White” and other names of popular local companies. Together, this is a real indicator that this is a dynamic region filled with ups and downs and complexities in a fast moving environment. Silicon Valley has an image problem, should they fix it? Beyond all the positives of entrepreneurs chasing their dreams to change the world (while getting rich at it), Silicon Valley has a perception issue relating to an insular entitled group of rich assholes. A question I have for you is: Is Silicon Valley aware of this perception gap? Do they care? Should they do anything about it? Or is this just the natural state of an innovation area? Love to hear your thoughts in the comments. Could you imagine the Santa Clara or San Mateo chamber of commerce funding a PR campaign to recast the stereotypes? Could you imagine cultural education and PSA emerging to billionaires to not flaunt it? Or just let it be. Update: Francine Hardaway says that Chambers of Commerce in Silicon Valley area shouldn’t waste any resources on a PR campaign.